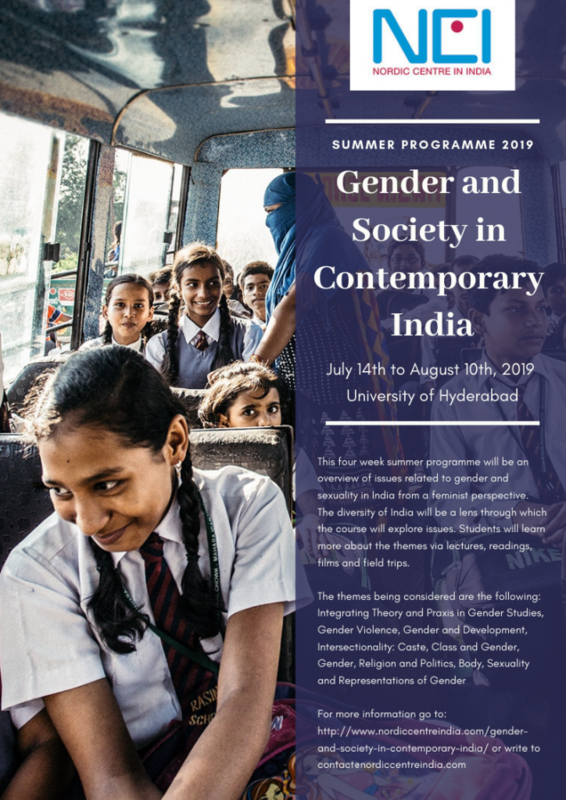 “Gender and Society in Contemporary India” is a four-week-long intensive summer course at University of Hyderabad that aims to provide an overview of issues related to gender and sexuality in India from a feminist perspective. The diversity of India will be a lens through which the course will explore issues. Students will do readings, watch films and have some field trips to understand the reality presented. Field trips are included so that students get a chance to visit NGOs working on women and child labour, self-help groups, community media and activist groups such as Hyderabad for Feminism. Seven modules have been chosen and there will be faculty from the university from sociology, political science, women’s studies, regional studies, and communication participating in the teaching of the modules. On completion of the course students should demonstrate an interdisciplinary understand of the diverse gender issues in contemporary India. They should be able to move away from existing stereotypes and critically evaluate patriarchal social practices. Located in the cosmopolitan city of Hyderabad, the intensive course includes daily lectures, field visits, assignments, preparatory readings, and the writing of a term paper. The course, open to students from all disciplines at the member universities of NCI, is organized by the Study in India Program at the campus of University of Hyderabad. Admission: 1 to 2 years of college or university studies with minimum grades equivalent to 3.0 GPA on a 4-point scale or grade C according to ECTS. At the end of the course, the students should have an understanding of the diversity in Indian society and also get a sense of feminisms from different structural standpoints of caste, class, gender, sexual orientation and ethnicity to name a few. Click on Download for more information about the modules covered. The course will be for 7.5/10 ECTS depending on the requirement of the student. Teaching will be both classroom lecture based, screening of films and field visits to NGOs and other organizations. Evaluation will be primarily done by the course coordinator. Readings for each module will be given at the start of the course. Seminar presentations by students: 4-5 afternoon sessions during the fourth week. Upon successful completion of the summer course, the students receive a grade transcript from the University of Hyderabad and a certificate along with supplementary documents from the Nordic Centre in India that can award them 7.5 ECTS at their respective home university. For students who wish pursue 10 ECTS it is also possible to do additional assignments during the same period of time. Since the course is designed to suit students from Nordic universities with European and national credit systems, students are requested to consult the International offices for information about how to translate and register the course credits at their home university. A motivation letter including contact information. A CV or other related material to support the application. The admission procedure is conducted by nomination, i.e. after the International offices have received and reviewed the applications they will nominate students qualified for the summer course to the Nordic Centre in India (NCI). The final selection of students is made by University of Hyderabad. The students admitted to the course will be given a letter of admission from University of Hyderabad and can apply for study visa through the Indian embassy in their home country. The cost of the summer course will be INR 110970 (currency converter) for single room accommodation and INR 105470 (currency converter) for twin sharing accommodation. The amount covers all local costs, including the course fee, board and lodging at Tagore International Student Guest House, shorter field and study trips, and the use of medical facilities and the library at University of Hyderabad. Most of the reading material is also provided in photo copies or from the library. The cost does not include expenses for travels to and from Hyderabad, visa fees, or medical and travel insurance, for which the students need to pay by themselves. Click on Download for instructions on how to make the payment. Information regarding the University, your stay, and other practical matters can be found here and information on how to prepare for your programme can be found here.